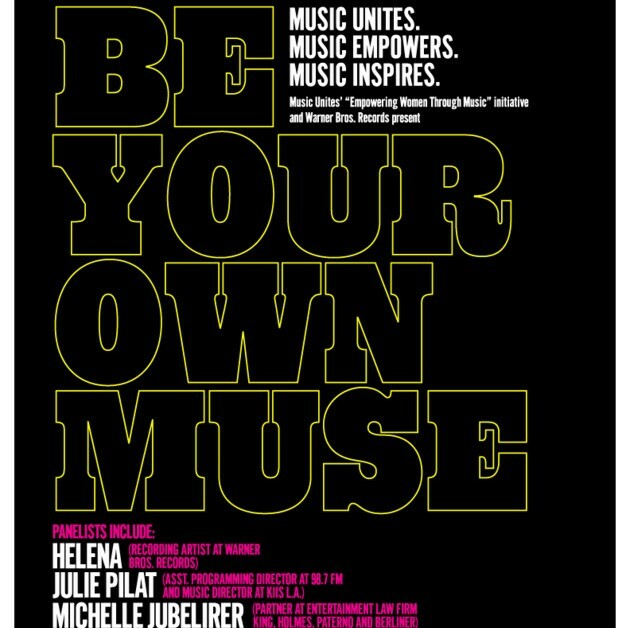 MUSIC UNITES BE YOUR OWN MUSE PANEL AND WORKSHOP IN LA AT THE HOUSE OF ROCK! As part of Music Unites’“Empowering Women Through Music” initiative in Los Angeles, Music Unites together with Warner Bros Records will kick off “Be Your Own Muse,” an educational workshop to take place on September 15 from 11 a.m. – 2 p.m.This workshop focuses on educating young girls from Compton middle and high schools about the careers behind the music business. The panel will include a Q&A session with some of the most influential women in the industry along with a songwriting workshop to follow at the BlueMic studio with Warner Bros Records recording artist and singer-songwriter Helena, and Music Unites standout student, Candace Lee Camacho. “Be The Muse” panelists will include: Shira Lazar (Co-Founder, What’s Trending), Helena (Warner Bros Records recording artist), Caroline Yim (Music Agent, ICM Partners) Julie Pilat (98.7, Assistant PD / Music Director KIIS Los Angeles), Kelly Watson (VP Sales & Strategic Partnerships at Spin Media) and Michelle Jubelirer (Partner at King, Holmes, Paterno & Berliner).